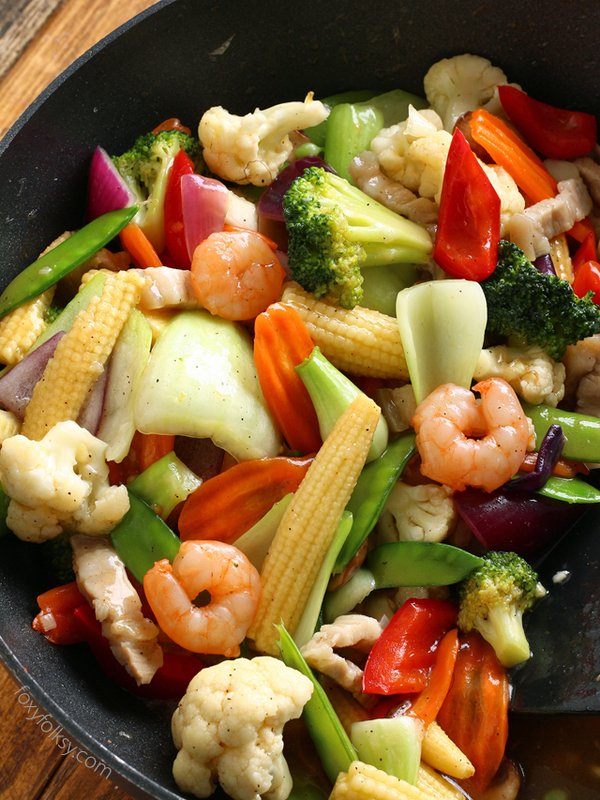 Try this Chop Suey recipe for an Easy stir-fry of colorful vegetables with thick sauce. A great vegetable dish for a dinner party or just for an everyday healthy meal. The good thing about cooking Chop Suey is, you can use as much variety of vegetables as you like. You can choose whatever you want or omit the ones you do not like so much and even when you just have three kinds of vegetables, it could still come out great. You cannot really go wrong with Chop Suey, unless you over-cook your veggies and they become too soggy, which is still edible of course but maybe a bit lesser appetizing. I got inspired to cook this Chop Suey because we’ve got so many left-over veggies in the fridge that needs to be cooked soon like the broccoli, cauliflower, mushrooms and a bunch of pak choi. And I just harvested some sugar snap peas and added some of the young ones to the dish. Carrots and bell peppers are stapled in our fridge but I have to ask Armin to look for young corn from the grocery store on his way home, unfortunately, we only get the bottled ones here. 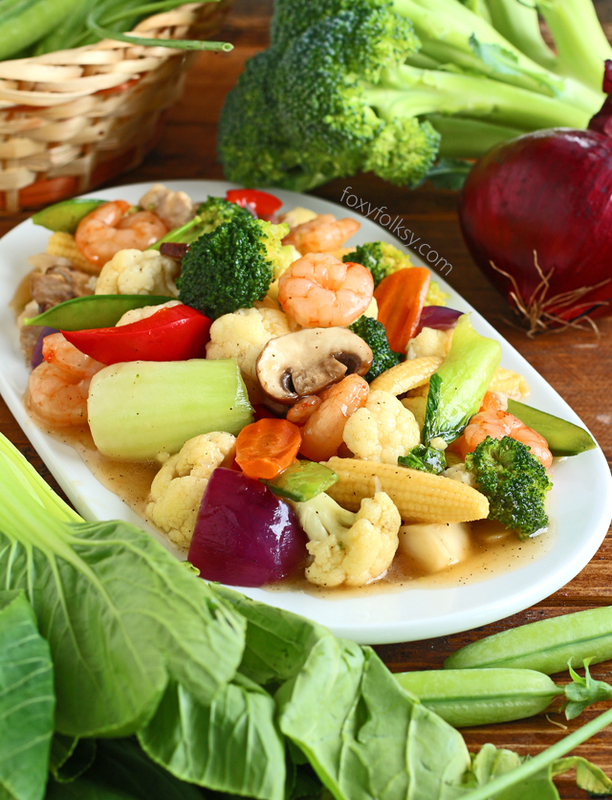 Chop Suey recipe for an Easy stir-fry of colorful vegetables with thick sauce. 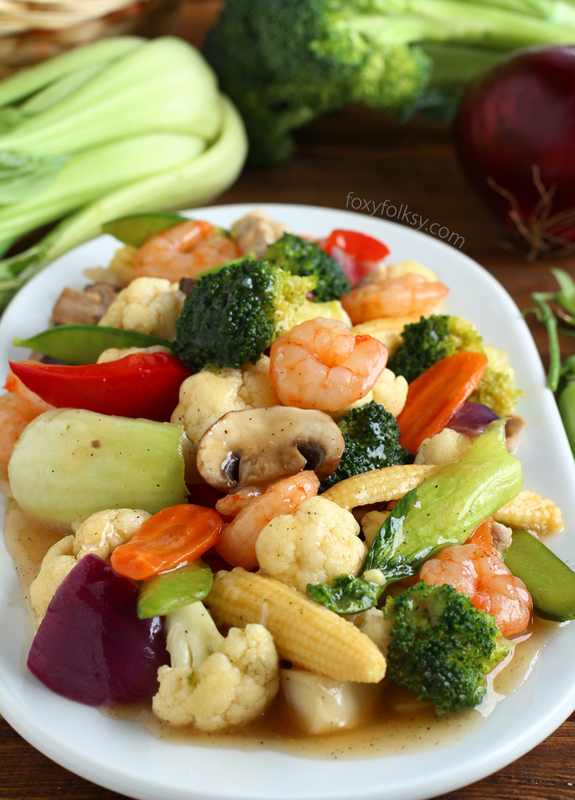 A great vegetable dish for a dinner party or just for an everyday healthy meal.Try this Chop Suey recipe for an Easy stir-fry of colorful vegetables with thick sauce. A great vegetable dish for a dinner party or just for an everyday healthy meal. In a wok or big skillet, heat oil over medium heat. Saute garlic until softened. Add the pork belly slices and cook, stirring regularly, until all side are done. Add the shrimps and do the same. Pour the cornstarch mixture into the wok and add the oyster sauce and ground pepper and bring to a boil. Doing this from the beginning keeps the veggies crisp and helps prevents over-cooking them. Add the first batch of vegetables: broccoli, cauliflower, carrots and sugar snap peas and cook covered for about 2-3 minutes. Add the rest of the vegetables and cook for another 2-3 minutes or until vegetables are tender-crisp and the sauce has thickened. Season with salt if still needed. Serve hot. Can you use sesame oil instead of vegetable oil? Hi Tanya, vegetable oil has a neutral flavor and sesame oil has a rather stronger flavor so it may overpower the rest of the ingredients. Delicious and pretty straightforward procedure. You can’t go wrong with this recipe. Hello and warm regards . I came across to your website while I was searching for some chop Suey recipes. I liked it and actually made it that day. I just followed everything you’ve written except for chicken. ( I have chicken allergy). 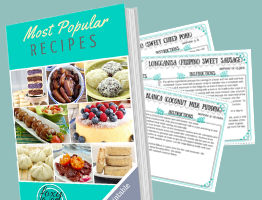 I substituted it with thinly sliced pork belly and oh ,I also added celery stalks and it came out really good and tasty.I printed your chop Suey recipe, have it laminated and put it with the rest of my recipe collection binder. 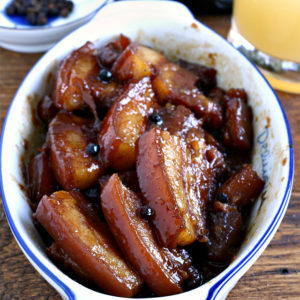 Hi Edward, thanks for the nice comment and I am glad you enjoyed the recipe! Hi im anna* I love to cook.. I. Also one of the fans of foxyfolksy recipe im always wants to experiment other meals to my kids… my background of family is best cooker thats why I want to to continue.. hopefully someday I have my own restaurant… notes: everytime u cook give full of love to become success your meals.. ..
Do you have recipe on how to make soya milk? Hi Lourdes, I do not have it yet but I will add it to my to do list. Thanks! 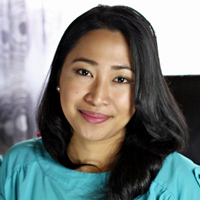 Thanks Bebs for sharing this recipe…simple, fast and tasty!